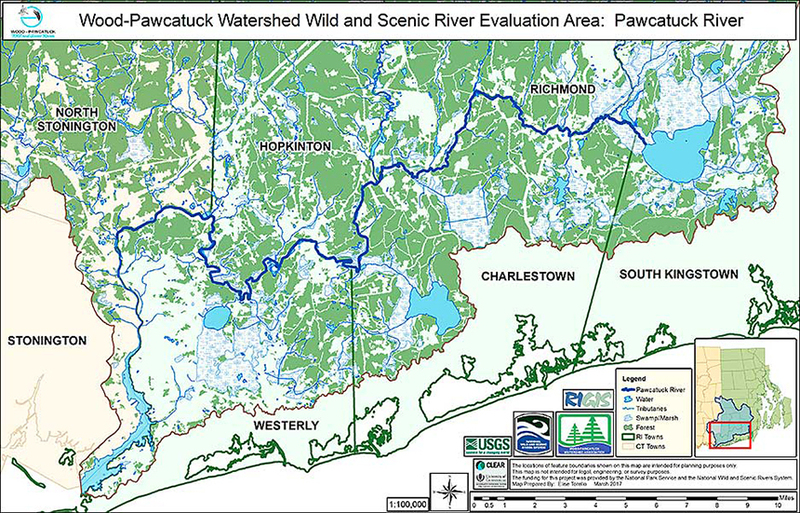 The recently completed Wood-Pawcatuck Wild and Scenic Rivers Study, a bi-state partnership supported by local organizations and the National Park Service, targets seven rivers in the Wood-Pawcatuck watershed for National Wild and Scenic Rivers designation. The two-state effort included representatives from the eight Rhode Island and four Connecticut towns in the watershed, as well as both state environmental agencies and four conservation organizations. Formal designation will allow the National Park Service to provide money to be allocated to the 12 local communities for future river stewardship. The study committee included town-appointed representatives from Charlestown, Exeter, Hopkinton, North Kingstown, Richmond, South Kingstown, Westerly and West Greenwich, R.I., and North Stonington, Sterling, Stonington and Voluntown, Conn. The committee was rounded out by representatives from the Rhode Island Department of Environmental Management, the Connecticut Department of Energy and Environmental Protection, Wood-Pawcatuck Watershed Association, Save The Bay, The Nature Conservancy and the Audubon Society of Rhode Island. Together, they documented that the rivers contain many remarkable values. More importantly for the current effort, they determined that there is already a great deal of protection for these rivers through town and state regulations. A stewardship plan, developed to help protect the rivers, was created in cooperation with local communities and is heavily influenced by local and regional needs, but will have overall benefits to everyone in both states, according to the study committee and its supporters. The Wood-Pawcatuck watershed is 300 square miles. The seven rivers up for Wild and Scenic designation are the Beaver, Chipuxet, Green Fall-Ashaway, Queen-Usquepaugh, Pawcatuck, Shunock and Wood. The designation would help protect locally important cultural and natural resources, including geology, ecosystems, water quality, Native American archeology, historic mill villages, scenery, and recreation opportunities. The next step in this process is to have all 12 towns and both states pass a resolution to support the Wild and Scenic designation. With this support, congressional delegates will submit a bill in October to amend the National Wild and Scenic Rivers Act to include the seven rivers. A Wild and Scenic Rivers designation provides a key opportunity to promote local and state economic development and tourism, according to supporters. It would also open up more recreational opportunities and create more educational and outreach programs. The stewardship plan will focus on protecting water quality and drinking water. The Environmental Protection Agency designated the Wood-Pawcatuck watershed as a “sole source aquifer,” meaning that all of the residents of the watershed get their drinking water from groundwater wells. Another priority of the plan is to preserve important wildlife habitat.